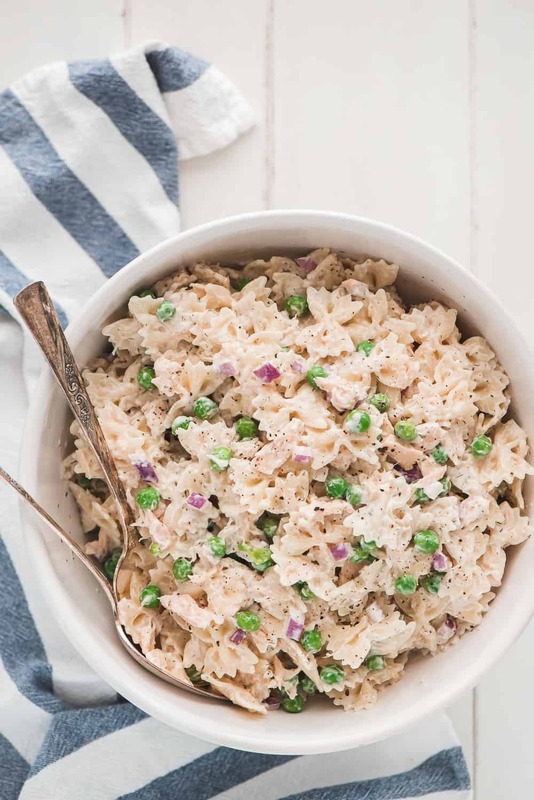 Tuna Pasta Salad is so easy to make and it is packed with protein! 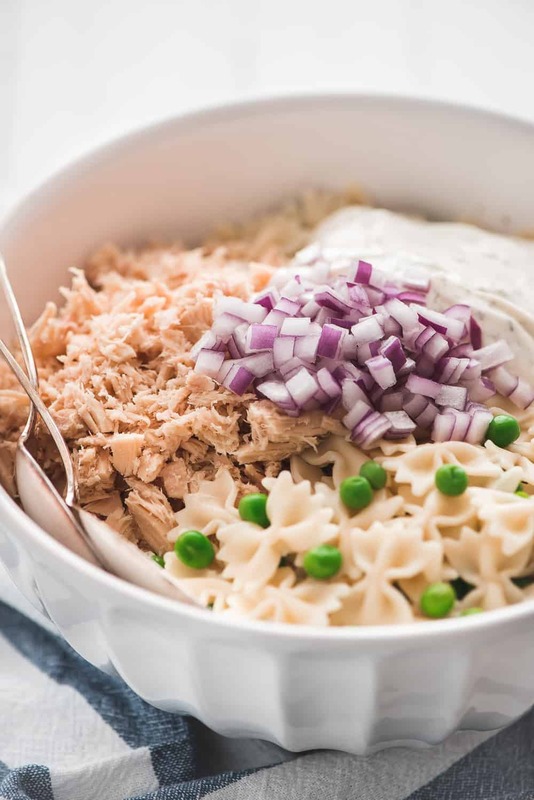 If you love tuna fish then you will love this pasta salad! Hello again! 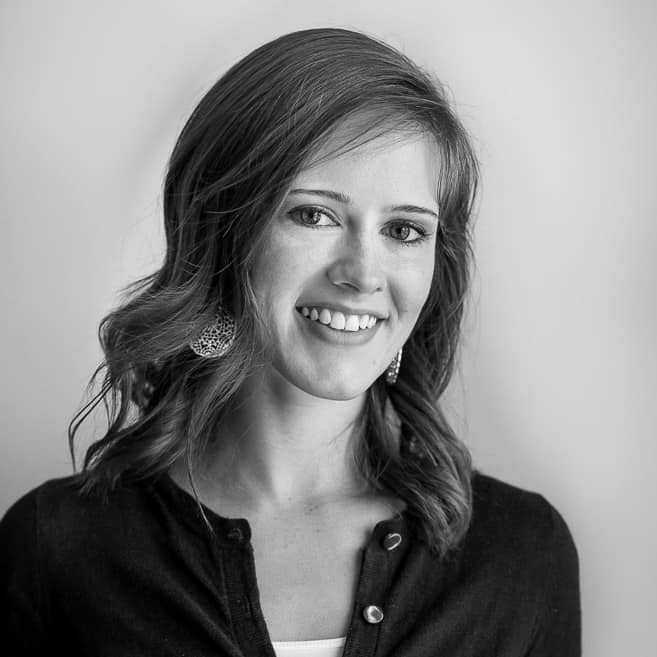 Melanie here again from Garnish & Glaze. Today I’m sharing a super easy pasta salad that’s packed with protein and made light by using Greek yogurt. 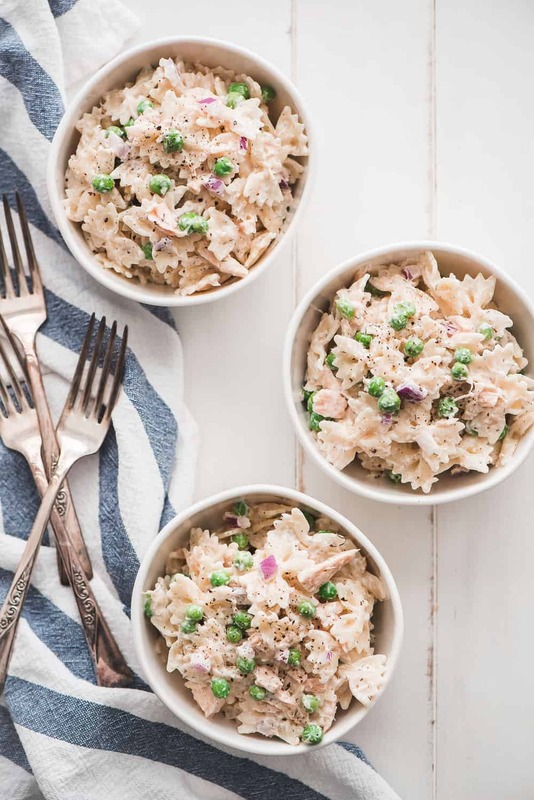 If you like tuna fish then you’ll for sure love this Tuna Pasta Salad! The first step is to get your pot of water boiling and cook the noodles. After the noodles have cooked for 5 minutes you’ll then add the peas and cook another 2 minutes. If you decide to use a different (larger or thicker) pasta you’ll need to adjust when you add the peas. You only want to cook them for 2 minutes, so toss them in the pot two minutes before the directions on the box says to finish cooking the pasta. Once done, drain and then place in a bowl of ice water. Once cool, drain again. Meanwhile, you can get everything else for the salad prepared. For the dressing, you’ll mix together the mayonnaise and Greek yogurt. I prefer to use Canola Oil Mayonnaise since it has fewer calories but still has the same texture and taste of regular mayonnaise. Using Greek yogurt also helps lighten up this classic salad as well as adds even more protein. To season the dressing, add dried dill and salt & pepper, to taste. Dice up the onions and then prepare the tuna by flaking it into small pieces with a fork. Just make sure you use white albacore tuna for best results. Mix it in with the cooled drained pasta, add the dressing, and toss. Serve right away or chill in the fridge until ready to serve. 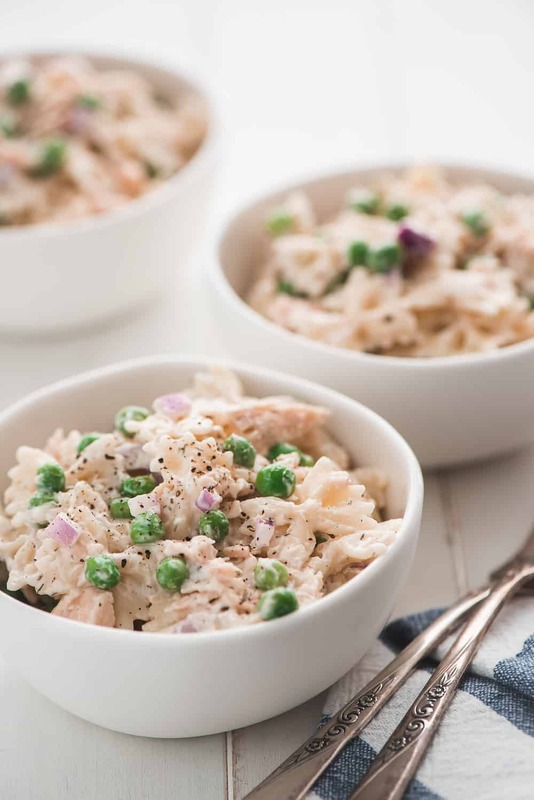 This Tuna Pasta Salad is perfect for lunch or to bring as a side to a barbecue. Enjoy! Boil salted water. Add noodles and cook for 5 minutes. Add the peas and cook 2 more minutes or until pasta is al dente. Drain and place in a bowl of ice water. In a small bowl, mix mayonnaise, Greek yogurt, dill, and salt & pepper together. Drain the pasta and peas and then place back in the bowl. Add the tuna, red onion, and the dressing. Toss and add more salt & pepper to taste. Serve or chill until ready to serve. Yum! I’m sooooo into pasta salad right now. It must be spring, but you’re right this is absolutely perfect for lunch. I made this recipe and it was very easy and delicious! I will be keeping it in my file for future church gatherings and family get-togethers. It is also perfect for a meal on a warm spring or summer day. Thank you for sharing!